Colorado Adventure Center in Idaho Springs is guaranteed to put smiles on the faces of adventurers of all ages. For 30 years, we’ve been helping families and groups make memories that last a lifetime. This season, thrill-seekers are clambering to get to the new Colorado Sky Trek, a multi-level aerial adventure course in Clear Creek Canyon. In addition to the Sky Trek, you can also book rafting trips, zip tours and packages that combine all three. 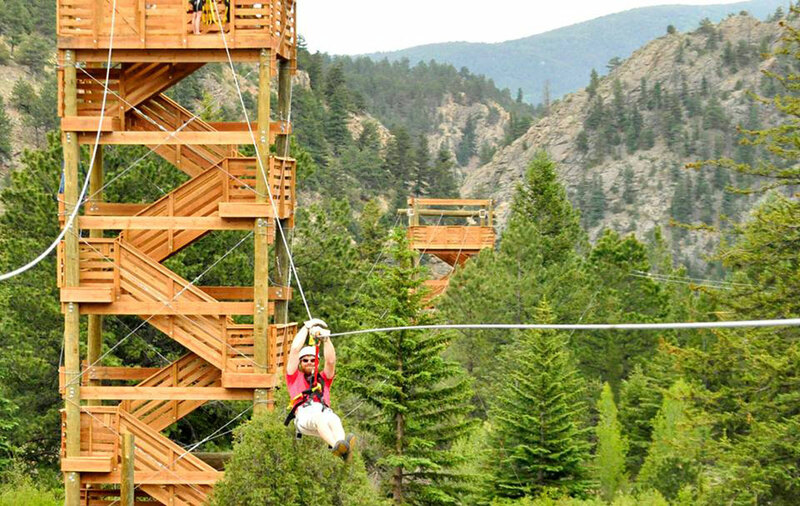 Colorado Adventure Center in Idaho Springs is an easy 35-minute drive from Denver and just 45 minutes from Summit County along I-70. Visible from the interstate, Colorado Sky Trek is one of the state’s newest attractions. The mining-themed course features three routes and levels of difficulty. Climbers can decide how much challenge they want to face and test their mental and physical abilities — you can even start out on the easiest level and as your skill and confidence grows, and then work your way up to the harder elements. Calling all “American Ninja Warrior” wannabes: Colorado Sky Trek features 55 challenging elements that will make you feel like you’re a star-in-training for the hit show! The object of the aerial park is to challenge your perceptions and get you to move out of your comfort zone. You’ll actually become braver as you learn to trust yourself and build confidence. Sky Trek guides are available to help coach you through the course, providing advice and encouragement along the various routes. If you should “fall,” you’ll actually only drop a few inches. Favorite elements include a suspended bottomless raft, a pickaxe swing, monkey ropes, Swiss cheese, a spider’s web and the most nerve-wracking of all — the tight rope. 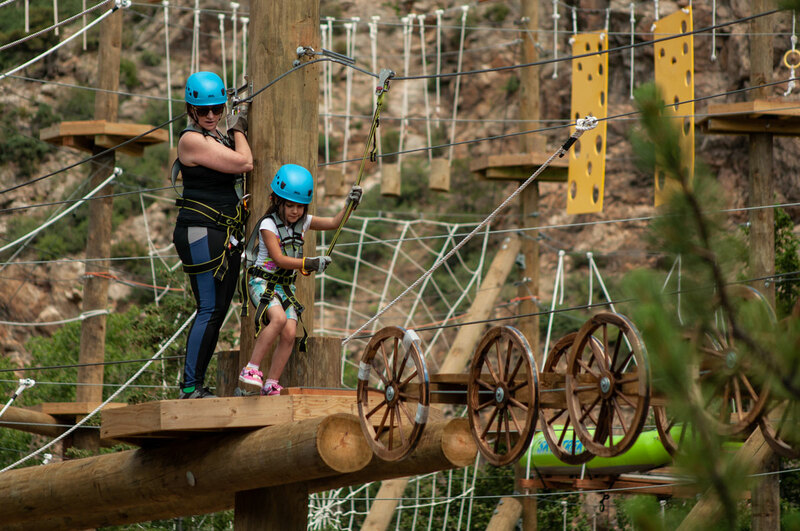 Colorado Sky Trek is a new and thrilling addition to Colorado Adventure Center’s crowd-pleasing other offerings of whitewater rafting and ziplining. Clear Creek tumbles out of the nearby mountains, providing a huge variety of opportunities to paddle, play and cool off. From beginner to advanced, with Class II to Class V rapids, there’s a little something for everyone. When it comes to even more high-flying fun, soar above the treetops in Clear Creek Canyon on our zip tours. Start by climbing the 65-foot-tall towers, then leap and fly like the wind from one tower to the next, for a total of eight separate zip lines and nearly a mile of foot-loose merriment. Colorado Adventure Center’s handy packages enable you to participate in multiple activities without extra planning — and you’ll save money by bundling activities. Choose what works best for you, your family or your group. Spend the morning sky trekking or ziplining and have a delicious lunch served creek-side under a shady canopy. During the afternoon, cool off with a raft trip. Photographers capture all the special moments and candid expressions of your rafting and zipping journey (Colorado Sky Trek photography is coming soon), so all you have to worry about is having a blast. Colorado Adventure Center’s guides are fully certified and extensively trained. They maintain current First Aid and CPR certifications. Some of the outfitter’s guides even hold Swiftwater Rescue and Wilderness First Aid certifications or have extensive training as EMTs and Wilderness First Responders, but all are passionate about showing you a good time on the water and in the air. Before departing for a raft trip, zip tour or sky trek, you’ll attend “safety school” where guides will provide instructions and answer any questions you many have. Adventure awaits at Colorado Adventure Center! 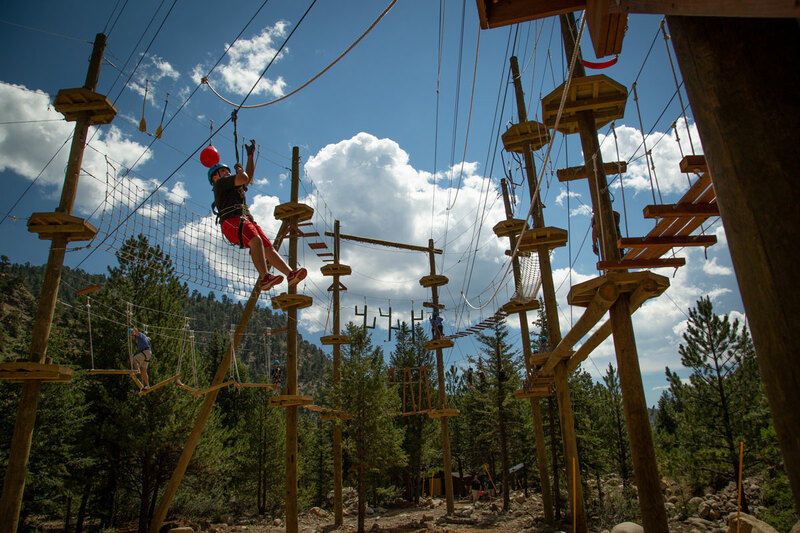 Add the new Colorado Sky Trek, rafting and ziplining to your summer vacation plans.